This stylish third floor apartment is in a beautifully converted Georgian building located in a prime George Square location. With Queen Street (200metres) and Glasgow Central (800m) stations so close by, this is a fantastic apartment to visit the city centre. The building offers security entry and elevator. The hallway leads to large bedroom, bathroom and open plan living/dining/kitchen. The living area has a flat screen Digital TV, Freeview, DVD player, leather sofa, a comfortable sofa bed, free Wireless internet access and dining table for two guests. The modern kitchen has integrated appliances including oven, hob, microwave, dishwasher and washing machine/dryer. The bedroom contains a king-size bed, two fitted wardrobes and lots of light from the large windows. The modern bathroom, with shower above the bath, completes the accommodation. There are several supermarket stores close by on Ingram and Glassford Street. 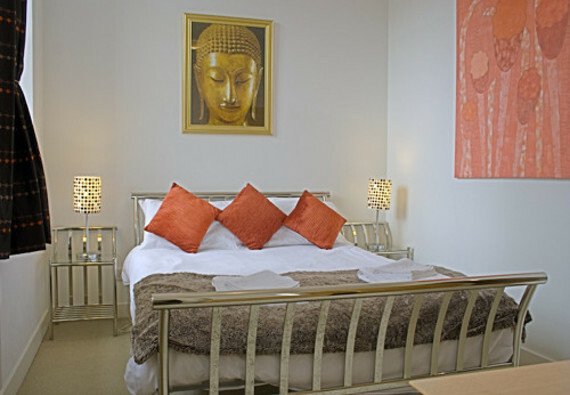 The accommodation is just 50m from George Square and is perfect for tourists hoping to catch the city or airport buses. The Gallery of Modern Art is just 200m from your door. The building is also within 5 minutes walking distance to the University of Strathclyde and Glasgow Caledonian University. The closest parking is in Glassford Street or Virginia Street. Scott House is within the Merchant City area of Glasgow; one of the most vibrant districts and full of diverse and interesting architecture, cafés and restaurants. It is a preferred location to both professional and artistic residents with a number of small galleries and theatres in the area. It is also home to a number of high end boutique style shops and more famous international labels at the Italian Centre. The annual Merchant City Festival and Celtic Connections attract a growing number of visitors each year who enjoy concerts, Scottish Ceilidh dances, comedy events and exhibitions at venues, including the Tron Theatre, the Old Fruitmarket, the Trades Hall, St. Andrews in the Square, Merchant Square, and the City Halls. We do not accept stag or hen parties unfortunately. A 25% deposit is payable on booking and the outstanding balance is due no later than 14 days before your arrival. Keys may be collected from our City Centre office at 59 James Watt Street, G2 8NF or we can offer a "meet and greet" service, whereby a member of the team will meet you at the apartment. We require identification and a security deposit of £100 which is fully refundable when you sign for the keys. Check-in time is between 2:30pm and 8pm, but we will always try to allow access earlier if requested subject to availability (Later check-in can be organised by prior arrangement and will be subject to an additional fee). Check-out is by 10:30am. The city centre is home to most of Glasgow’s main cultural venues: The Theatre Royal, The Pavilion Theatre, The King’s Theatre, Glasgow Royal Concert Hall, Glasgow Film Theatre, Tron Theatre, Gallery of Modern Art (GoMA), Mitchell Library and Theatre, the Centre for Contemporary Arts, McLellan Galleries and The Lighthouse Museum of Architecture. The world’s tallest cinema, the eighteen-screen Cineworld is situated on Renfrew Street. The city centre is also home to four of Glasgow’s higher education institutions: The University of Strathclyde, The Royal Scottish Academy of Music and Drama, Glasgow School of Art and Glasgow Caledonian University. Parking notes The nearest Car Park is located in Glassford Street, costing £15 per 24 hours. No reviews yet for South Frederick Apartment.